This episode is about Texas, a boy and his dog and the unthinkable and inevitable decision that comes to almost all pet owners. D.S. Moss confronts “How do you know when it’s time to make the decision to say goodbye?” to a four-legged family member. If you're a person with a pet, know a person with a pet, or just like a sad ‘ol country song - this episode confronts the toughest conversation yet and provides insights for those that must eventually face that same decision. 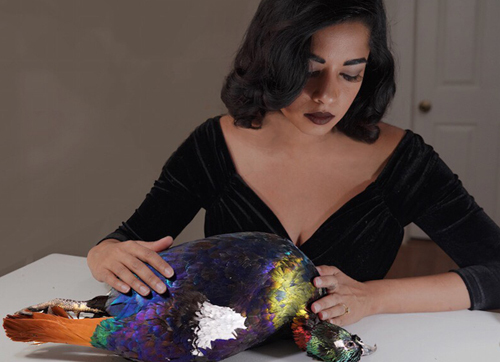 Divya Anantharaman New York City's premiere taxidermist. An award winning licensed professional preserving animals with honor and compassion, she took second place in the Professional division at the 2017 World Taxidermy Championships, and is the coauthor of the book "Stuffed Animals: A Modern Guide to Taxidermy." Her specialties are birds, small mammals, and anatomic anomalies. She works part time as a restoration assistant at the esteemed studio of Wildlife Preservations where her love of historic taxidermy grows through helping preserve these treasures, and is a board member of the New England Association of Taxidermists. Her clients include museums, art galleries, and private collectors, though she really enjoys demystifying taxidermy for newbies through workshops and lectures. In her commitment to conservation, she regularly works with various organizations like the Audubon Society, and volunteers as a rescuer/rehabber. All animal parts are legally and sustainably obtained. InstaVet is made up of a small team with a big vision to revolutionize pet care through the power of technology. Their vet partners are leading the way by providing the highest level of care in the comfort of home, making the experience more convenient for you and less stressful on your pet. They offer a full range of veterinary services, including wellness care, vaccinations, diagnostics, pet travel certificates, and holistic/acupuncture care to help your pet stay healthy and active..
Jennifer Breslow LCAT, ATR-BC, CASAC, is a Licensed Psychotherapist, Art Therapist and Pet Loss Counselor in private practice in New York City. She has been trained in pet loss and bereavement counseling by the Association of Pet Loss and Bereavement, and has extensive experience helping people use their innate creativity for growth and healing. Through her personal and professional experience, Jennifer recognizes the deep bond that is possible between humans and animals and the devastating loss and grief that is felt when a beloved pet passes. She offers individual counseling and group counseling sessions to help people move through a loss of a pet and any unresolved issues that a loss may trigger. More information can be found on her website, artpsychotherapynyc.com. Kate Hoover sews burial shrouds for humans and their pets. She founded Vale Shrouds to continue the contemplative sewing practice she began while a chaplain intern with the New York Zen Center for Contemplative Care. At NYZCCC, she was asked to plan her own funeral to gain awareness of her own impermanence and fears about death. While researching her options, she learned about green burial, decided to sew a shroud for herself, and accidentally found a calling. She will complete a Masters in Mental Health Counseling and Spiritual Care from Fordham University this spring.